The stuff we see, touch, and use everyday might not, at first thought, seem museum-worthy, but there are fascinating tales hiding within even the most below-average hunks o' junk out there. Sometimes all it takes is context to elevate the mundane to legendary status. We've rounded up a handful of exhibitions and collections that celebrate the stories—both real and fictional—that make ordinary things into classics, and showcase the inherent beauty in simple, tactile pleasures. 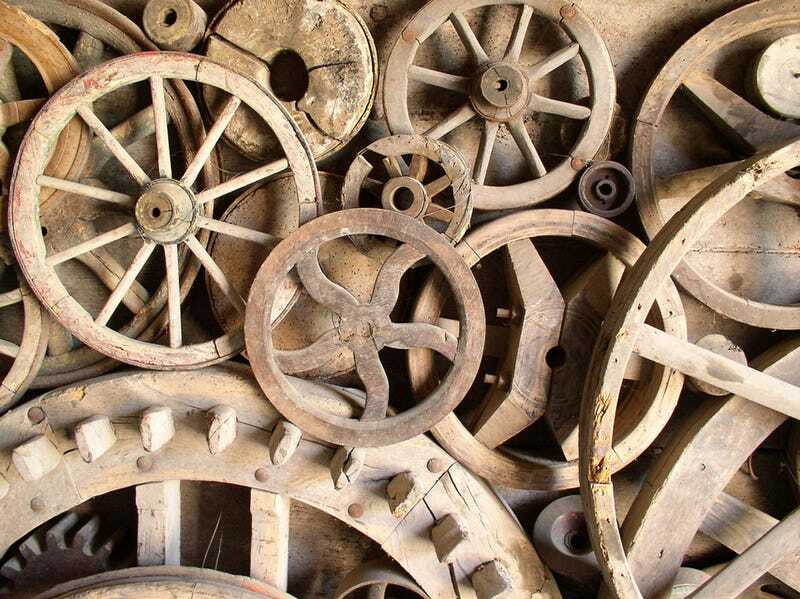 Whether they're tracing the history of a particular city, preserving personal memories, or fleshing out the timeline of our whole dang human world, these inanimate items have quite a bit of life left in them. Okay, admittedly there are quite a few pieces in this collection—rounded up by the BBC and the British Museum to mark how our human world has evolved—that are not common at all (not too many Rosetta Stones out there...). Maybe the most fascinating, though, is one of the first and one of the most basic: a stone chopping tool from the Olduvai Gorge in Tanzania that happens to be the oldest, artificially shaped object in the entire museum. It's a pretty safe bet that whoever made this wasn't thinking their handiwork would be on display for all the Internet to see, but here you go; now we can imagine what life was like way, way, way back. Like two million years ago back. Incredible. Plus, the curators pose an interesting question: Can we be considered human without tools? What do you think? The Checker Taxicab was a Manhattan staple from 1952 to 1986, before Taxi TV and paying by card was but a glimmer in anyone's eye. L.A. turned 232 this year! Happy birthday, L.A.! To celebrate its unique past, Los Angeles Magazine (with a h/t to the New York Times and BBC) picked out 232 objects that shaped the City of Angels. Some are more surprising than others, and they're not all glitzy glamorous Hollywood. Here's the hearty Cobb Salad, invented by the owners of the iconic Brown Derby restaurant in the 1930s. Before preservation efforts gained ground, memorializing a trip to a national monument meant taking a bit of it home with you. This exhibition at the Smithsonian's National Museum of American History chronicles various ways in which major moments were reduced to historically significant chunks of rubble, and other instances of illicit collections. A fragment from the Berlin Wall sold from a German flea market to a Canadian student to hawked it online. Consider this beautiful series a kind of StoryCorps for physical things. As part of the Portland Art Museum's Object Stories project, visitors are invited to bring their own treasures in and record an oral history of the pieces. This audio, along with images taken on-site, are all available to explore online. The voices add an intimate, touching depth to the collection, and it breaks my heart that I didn't do this with all the wonderful keepsakes that filled every nook and cranny at my grandparents' house. Seriously, this is such a wonderful idea. Good design endures through the ages, bringing together a magic mix of concept, execution, form, and function. This traveling exhibition, organized by the über-knowledgeable pros at the Vitra Design Museum, gives everything from pencils to canning jars to clothespins and safety matches a (well-deserved) place in the spotlight. Hidden Heroes will be at the Museum of Design Atlanta from February to May of next year. The 150 greatest hits on display at London's Design Museum represent the archetypes of industrial design in six different categories, and is meant to offer a glimpse into the backstory of how some of the most iconic objects of the 20th century came to be. David Mellor's post box, 1966. Wow. It seems like there are probably two kinds of people on this earth: Those who check out the Museo Ettore Guatteli's Flickr page and desperately want to visit what looks like an artful set of Hoarders, and those who bristle at the thought. I fall into the former camp, because this place—founded by an elementary school teacher and now home to a vast-as-all-hell array of cast-offs from daily Italian life—looks weird and awesome and I would love to go to there. This project (plus book) is pure lovely genius, and a twist on the theme. Rob Walker and Joshua Glenn sourced a treasure trove of random stuff on Ebay, then gave each of the finds to a writer tasked with imagining a past for their piece. The results are a genuinely wonderful testament to the power of a narrative, and the worth it can pretty much instantly impart to something with little-to-no monetary value, but a heck of a lot of sentimental meaning. Makes me think about all the bits and bobs I've saved over the years simply because they remind me of something wonderful, or sad, or strange, and the deep connections we forge with what is, essentially, total tat. What are your most precious things? Have you saved anything simply because of when and where you got it, or because a special someone gave it to you? Share your favorites below!